This charming exterior features a combination of stone, shakes, and vertical siding. Special details include a front porch, dormer, and gables with curved accents. The cathedral topped great room opens to a relaxing screened porch while the kitchen enjoys a nearby pantry and the single dining area is highlighted with columns and a tray ceiling. 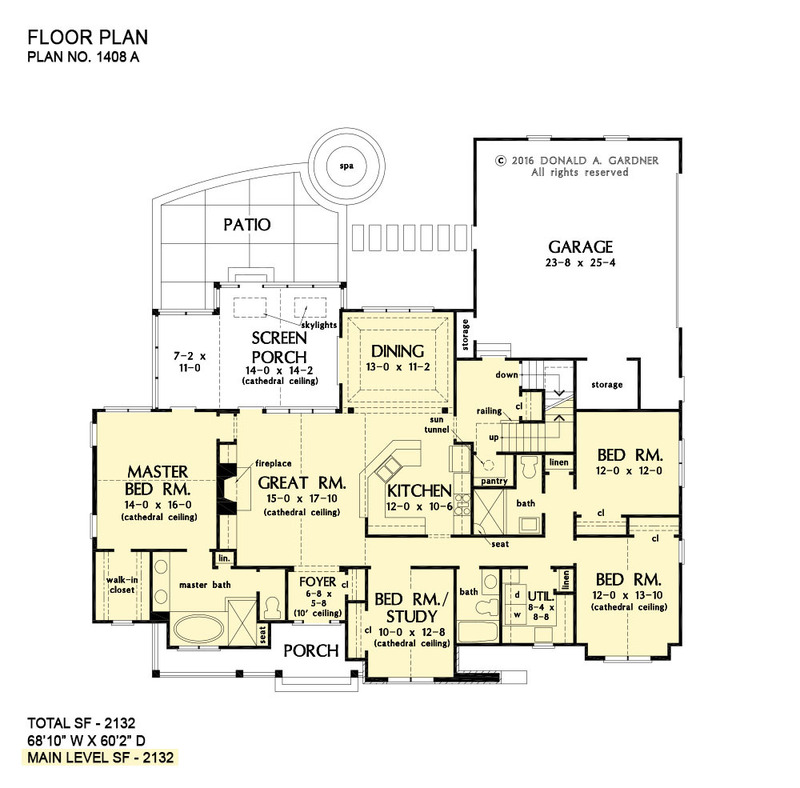 This open floor plan is great for keeping busy families connected and makes entertaining easy. The master suite gains vertical space with a cathedral ceiling and private porch access is perfect for enjoying morning coffee or letting pets outside. A spacious walk-in closet is suitable for two and the master bath boasts dual vanities, a standing shower, and a luxurious soaking bathtub. Three additional bedrooms are positioned around the utility room, making laundry drop-off and redistribution a breeze. Two additional baths and linen closets are available for children and guests. The garage is located at the rear of the home with two bays and extra storage. A bonus room above the garage offers additional storage or can be finished as a children's play room or an entertainment room for teenagers. 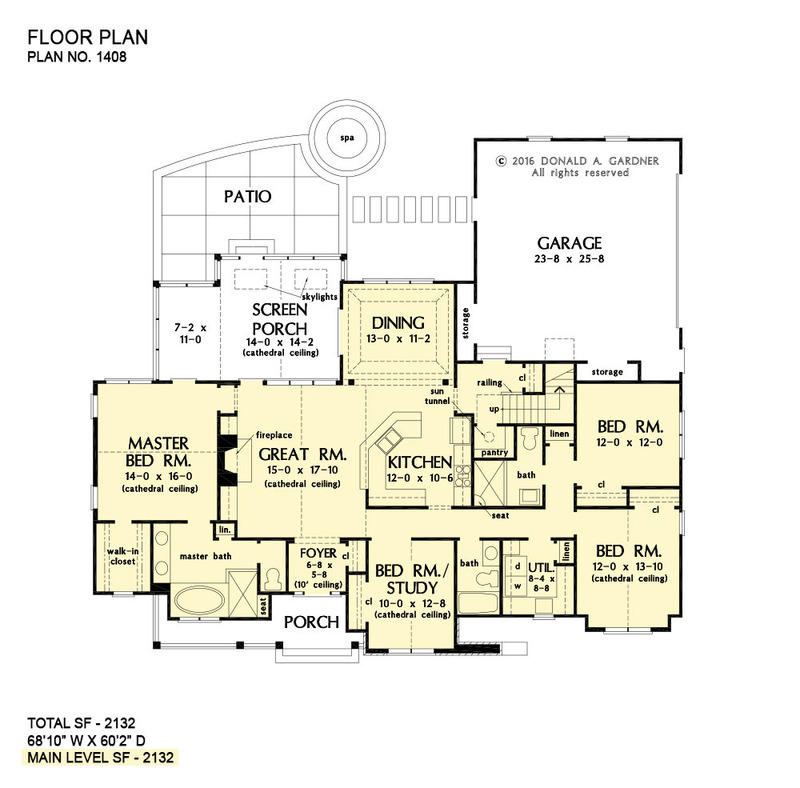 1st Floor: 2132 Sq. Ft.
Porch - Front: 110 Sq. Ft.
Porch - Screened: 304 Sq. 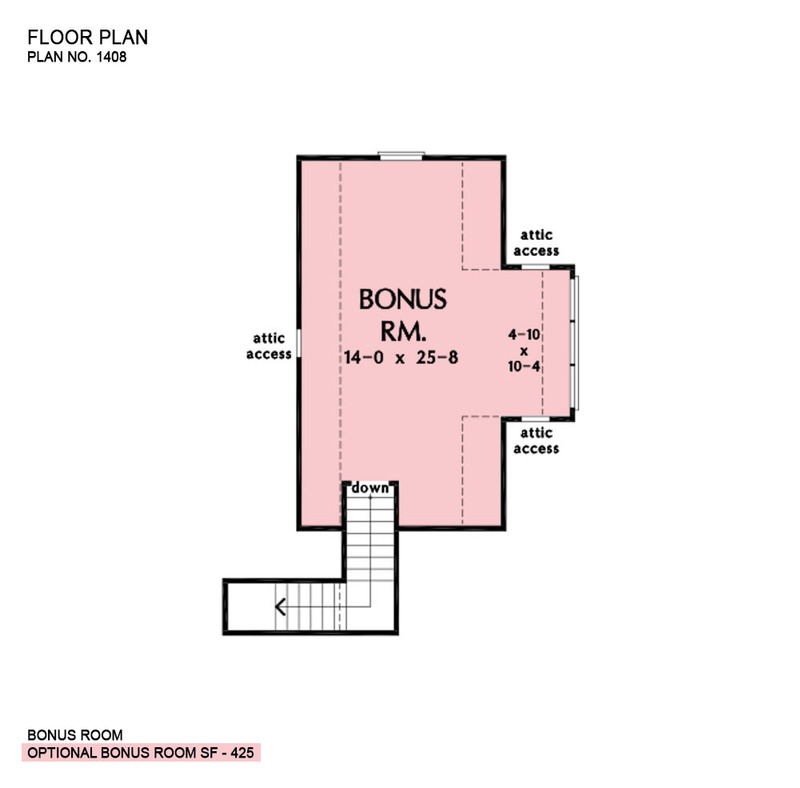 Ft.
House Dimensions: 68' 10" x 60' 2"
Great Room: 15' 0" x 17' 10"
Foyer (Flat): 6' 8" x 5' 8" x 10' 0"
Dining Room (Tray): 13' 0" x 11' 2" x 10' 6"
Great Room (Cathedral): 15' 0" x 17' 10" x 15' 0"
Kitchen (Flat): 12' 0" x 10' 6" x 9' 0"
Utility Room (Flat): 8' 4" x 8' 8" x 9' 0"
Bonus Room (Clipped): 14' 0" x 25' 8" x 8' 0"
Garage (Flat): 23' 8" x 25' 8" x 0' 0"
Garage Storage (Flat): 2' 0" x 9' 0" x 0' 0"
Master Bedroom (Cathedral): 14' 0" x 16' 0" x 14' 5"
Bedroom / Study (Cathedral): 10' 0" x 12' 8" x 12' 5"
Bedroom #4 (Cathedral): 12' 0" x 13' 10" x 13' 0"
Porch - Front (Flat): 8' 8" x 6' 4" x 9' 0"
Deck / Patio (None): 22' 8" x 14' 0" x 0' 0"
Porch - Screen (Cathedral): 14' 0" x 14' 2" x 13' 10"